"I like Tchaikovsky's First piano concerto the most!" Dear visitors, after a short break we have the opportunity to present to you yet another interesting conversation with one of the most interesting young pianists. 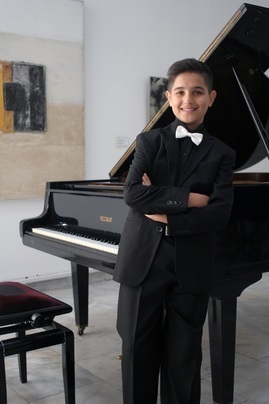 Even though he's only 13 years old, he is already a winner of several prestigious international competitions, a regular guest at several renowned concert venues and is facing a brilliant musical future. His name - Arda Mustafaoglu, a student of prof. Samira Mustafaoglu at the State Music and Ballet Educational Center "Ilija Nikolovski-Luj" in Skopje, Macedonia. At his age, Arda already accomplished many feats - First prizes in Skopje, Turkey, the Internet Piano Competition, he was a laureate at the Art Festival - Dojrana, Pernik, Bulgaria, Serbia, Absolute winner at the EPTA competition in Albania - and he has performed at the FMU Concert Hall, Salon 19,19, Daut Pasin Amam - Skopje, House of Culture - Kumanovo etc. Recently, Arda has performed in Vranje, R. Serbia where in a single day he has performed two concerts at the "Piano Summer" event, both as a soloist but also with the "Marmara" string quintet from Turkey, with whom he had performed Haydn's piano concerto. As you can see, more than one reason to talk with him as well as with his mother and professor Samira Mustafaoglu about their experiences. D: Arda, welcome to Musical Journeys. At the very beginning of our conversation let's talk about your first contact with music and the piano. When did you begin playing on the piano, why have you decided to play on piano and have you ever wanted to play some other instrument? А: Thank you. I began playing the piano at the age of 4. My love towards the piano comes from my mother who is a piano teacher. Often, I would visit her classes with her students so my first concerts came spontaneously. D: Prof. Samira, how did you, as a parent and later as Arda's teacher, feel about his beginnings? S: Аrda grew with the piano and his first performances were very spontaneous. I see and nurture his relationship with his instrument exclusively as a teacher. D: Arda, concerts are part of the every day life of a musician. You perform often, but what about stage-fright? Do you feel it sometimes and do you make a difference between performing at a concert and performing at a competition? А: Of course, I feel a positive nervousness and adrenaline which makes me perform better. I don't make a difference between a concert and a competition because I know that every time I perform I should give my best. D: Recently you had quite an interesting performance - actually, you played two concerts in one day. A rarity even in the lives of renowned professional pianists, even more so because you've learned the program in less than a month. What is all of this about, what are your impressions? А: It's about a concert realized as a marathon on an open stage as part of a master class called "Piano Summer" that took place in Vranje, Serbia. I performed solo, but also with the Marmara string quintet formed by university professors from the Marmara University in Istanbul, Turkey. It was very exciting because it was my first performance with a chamber ensemble. Also, I've worked with professors Masako Sakai (Japan), Shilde (Germany), and Zoran Imshirovich (BiH/Munich). D: Prof. Samira, Arda is a young but exceptionally talented and perspective pianist. What is your colleague's reaction when they hear him abroad? S: Arda took part at several important international competitions in a brief period, making a strong impression at jury members as well as the auditorium. The moment when after the performance his name is being announced as an absolute winner or laureate is quite an experience. The reactions of the jury members, after the awarding ceremony means a lot to me as a teacher, especially because the jury was carefully and seriously selected to include exceptional and renowned names from great musical centers in the world. The confirmation that he is very talented as well as the thrill from his interpretations is a nice feeling, but at the same time a huge responsibility. It's very motivational to see that the competition organizers and members of the jury offer Arda master class opportunities as well as continuous mentorship. D: Arda, we hear all about your successes and performances, but what about other pianists? Do you have a favorite pianist and who's the best pianist that you've had the opportunity to listen to in a live performance? А: Evgeny Kissin, Lang Lang, Valentina Lisitsa, Boris Berezovsky, Yuja Wang, Mikhail Pletnev.. the best one I've heard live is Boris Berezovsky. D: How does your ordinary day look like? How do you organize practicing and your other obligations? A: Everyday there's a period for practicing, and I organize the other obligations based on the practicing period. With good time schedule, so far I have time for studying and for relaxation. D: Prof. Samira, you're an established musician and pedagogue with many successes. What is necessary in order to build a professional pianist, and later to export him/her to an international level? S: In my experience, based on professional contacts at an international level where my students would perform and would get noticed by renowned pianists such as prof. Naum Shtarkman, I can say that I agree with the notion that above all you have to Want to become a pianist. But, this desire has to be realistic. Today, we are witnesses that pianism is in ascend. Colossal works are being performed at young age, so in order to become a pianist one must have a serious and reasonable approach. It's a long process of care, upbringing and way of life. The professional pianist has a continuous work ethic, natural nervation of the hand apparatus, emotional and psychological maturity at an early age, natural intellectual capabilities, interest and love towards concert performances, enriching one's knowledge at master classes with concert pianists and well-established professors. Of course, these professors work with young pianists who carry inside of them a tremendous concert-performing potential, students that are recognized at the music competitions. When we talk about mediocre students, they can become solid teachers and academic musicians with a tremendous effort and dedication as well as an excellent technique and schooling given by the teacher. D: Arda, do you have a favorite composer and are there some compositions that you would like to play one day? А: I have several favorite composers - Chopin, Scriabin, Haydn.. of course compositions too. I like Tchaikovsky's First Piano Concerto the most! Musical Journeys would like to thank prof. Samira Mustafaoglu and Arda Mustafaoglu. We wish them many more successes in the future, and we hope to hear Tchaikovsky's First piano concerto soon performed by one of the most promising young pianists - Arda Mustafaoglu!